Brookgreen gardens holds a special place in our hearts. The gardens are incredibly stunning, the grounds with three hundred year old oak trees in the Live Oak Allee make a wonderful backdrop for a bridal portrait session, engagement session, or wedding. Just outside of Murrells Inlet, South Carolina, the 9100 acre gardens are a sight to behold. Although we are wedding photographers in Greenville SC, we traveled to the Lowcountry for Fran and David's nuptials, and a few days prior to the wedding we photographed her bridal portrait session in the same setting where she would later be married. 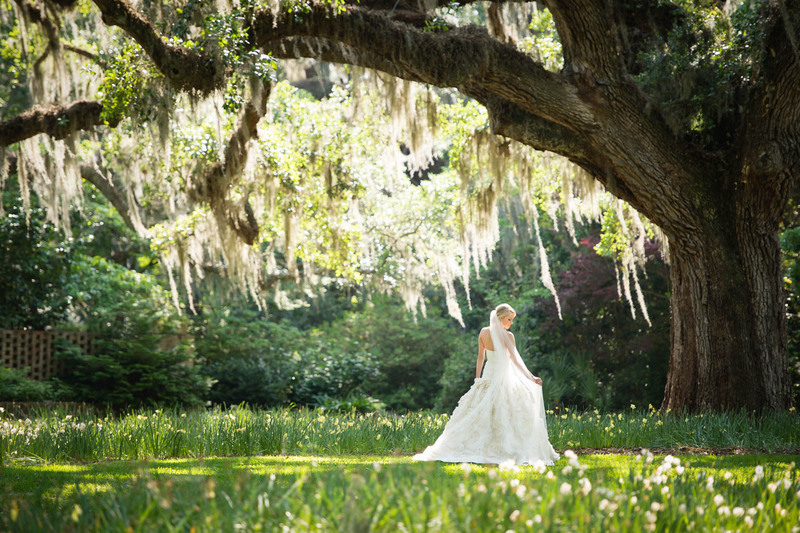 The sun shined through the live oak trees draped with Spanish moss onto Fran, the bride, and the blooming daffodils. I just love her pose and the way she is playing with her veil. Her arm gently reaches down to her veil mimics the wind blowing the Spanish moss that is above her head. The bride is a former ballet dancer, and it shows in the way she moves and carries herself. We rode on golf carts all around the property, but the Live Oak Allee was definitely our favorite location. Fran's wedding gown was a strapless Amsale ballgown with hand pleated silk taffeta on the dropped waist, and stunning flowers made from silk fabric on the skirt. It fit her like a glove, and you could tell that she felt like a princess wearing it!